This is an easy meal to throw together from items mostly found in your pantry, or from ones I keep on hand regularly. And it is one (of very few) casseroles that don’t get complaints from any of my children! You can use canned chicken, but I usually make a large batch of shredded or cubed chicken every few months, and then store it in Ziploc bags in the freezer to have on hand for meals like this. I buy a large package of chicken from a store like Costco, fill my crockpot with it, and then cook on low until it shreds easily, or I will chop the chicken into larger chunks. This recipe also includes 1 Tbs taco seasoning. You can use part of a packet, or it is easy and cheaper to make up your own for all of your taco seasoning needs. Recipe here: Homemade Taco Seasoning. 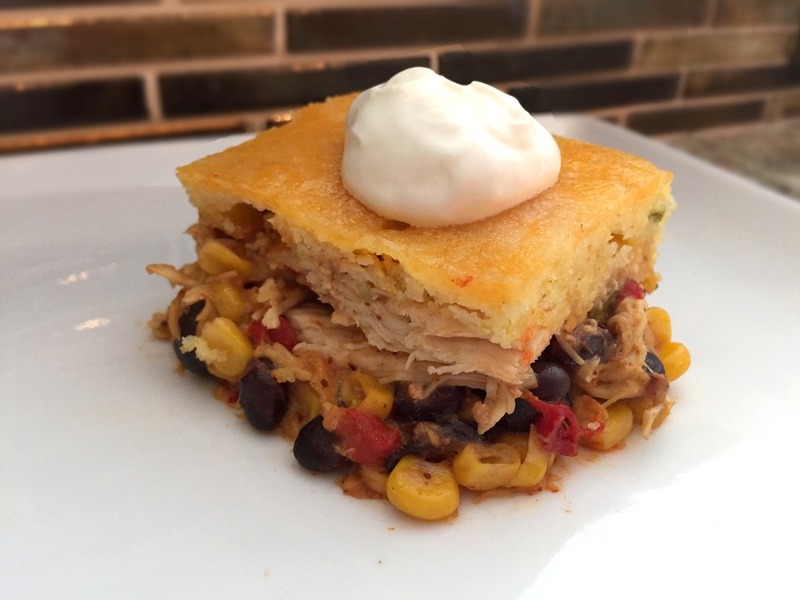 Combine chicken, 1 cup cheese, corn, black beans, olives, green chilies, red pepper, soup, salsa and taco seasoning. Spoon into a 9×13” baking dish. Cover with foil and bake for 30-45 minutes, until hot and bubbly. Remove from oven. Remove foil and stir. Prepare cornbread topping: Mix Jiffy muffin mix, eggs, melted butter and sour cream with a whisk. Spoon cornbread mixture over hot chicken mixture. Spread with a spatula to cover chicken mixture. Return to oven and bake, uncovered, for an additional 30 minutes or until cornbread topping is cooked through (test center with a toothpick). Cover loosely with foil if cornbread browns too quickly. Sprinkle with remaining cheese. Bake 2-3 minutes, or until melted. Let stand 10 minutes before serving. This looks super yummy! I love complaint-free casseroles, so I’ll have to try this for my family! !